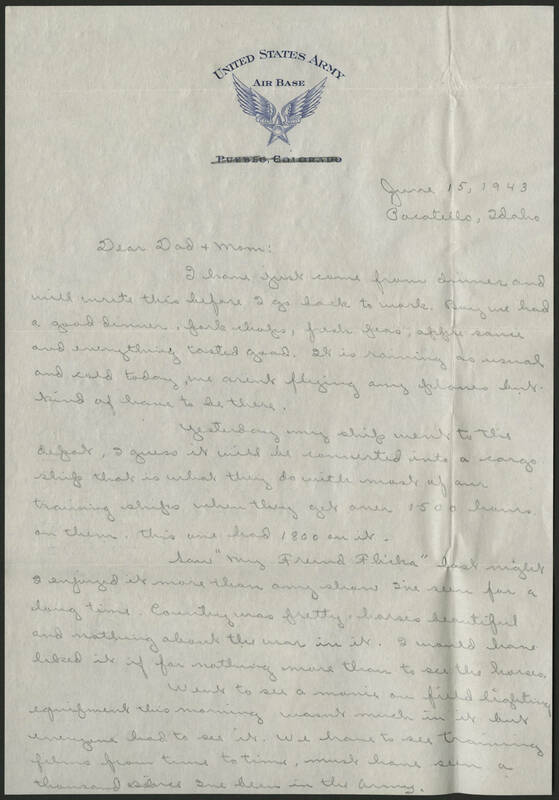 June 15, 1943 Pocatello, Idaho Dear Dad + Mom: I have just come from dinner and will write this before I go back to work. Boy we had a good dinner, pork chops, fresh peas, apple sauce and everything tasted good. It is raining as usual and cold today, we arent flying any planes but kind of have to be there. Yesterday my ship went to the depot. I guess it will be converted into a cargo ship that is what they do with most of our training ships when the go over 1500 hours on them, this one had 1800 on it. Saw "My Friend Flicka" last night I enjoyed it more than any show Ive seen for a long time. Country was pretty, horses beautiful and nothing about the war in it. I would have liked it if for nothing more than to see the horses. Went to see a movie on field lighting equipment this morning wasnt much in it but everyone had to see it. We have to see training films from time to time, must have seen a thousand since Ive been in the army.